Origin Intense training with the world's finest teachers. Occupation Professor of Eastern Religion and Philosophy. Kung-fu teacher. Known Abilities Number one martial artist on earth. Shang-chi, "The rising and advancing spirit", was born in 1952 in the retreat estate of the diabolical Fu Manchu in Honan, China. Raised in a bucolic setting without modern technology, Shang was trained by the world's greatest martial arts instructors to be the paragon of fighting technique and spirit, a worthy vessel for his father's ultimate resurrection. A pity for Fu that Shang's training included not only Shaolin fighting technique, but the Ch'an philosophy and meditation. For the Shaolin temple was founded by Bodhidharma, who brought Buddhism from the West to the East where it collided with Taoism. He taught the monks kung-fu to strengthen their practice and defend themselves. Immersed in this proto-Zen/Taoist fusion Shang-chi eventually learned to discern reality and in doing so to see through his father's illusions to the evil within. It would take more than his friend M'nai or his half sister Fah Lo Suee's words to sway him... it would take a mission to the West to kill a noble doctor, a run in with Fu's aged nemesis Sir Denis Nayland and, finally, a conversation with his mother to set him free. Shang wandered London and then New York disillusioned, but also excited by his being out in the world. He was forced to kill M'nai, who was sent after him by Fu. And then he joined MI6 in an effort to take down his father. He fought Nazi war criminals, members of his father's treacherous band of assassins -- the Si-fan -- and even his sister. And then he finally tired of the lies and the secrets and the destroying of lives in the world of spies and left British intelligence. He kept being drawn back into it, fighting robots, hypnotized slaves of Fu Manchu, falling in love with Leiko Wu. And his hatred of this world grew. Finally he confronted Fu Manchu on a space station, from which Fu planned to destroy the moon and turn the earth back to an agrarian ideal. Even more bizarre, Fu had reanimated his great ancestor Shaka Kharn and made him his new son and heir, to replace the traitorous Shang. Then it got weirder. Fah Lo Suee and her lover Zaran the Weaponsmaster were the first of several foes, and they brought back Fu, who bioengineered fighters to kill his son. Shang managed to overcome all. And then Fu attacked again, creating a clone he could put his mind into because the Elixir Vitae that had kept him alive for centuries was losing potency. Shang left him without the Elixir to die and finally retired to the life of a fisherman in a remote Chinese province until he was attacked by terrorists. After a series of events, a poisoned Shang took command of the Si-fan and used a cache of elixir vitae to purge the poison from his body, extending his life dramatically in the process. From her on out peace would elude him. He fought drug traffickers and supervillains along side superheroes, SHIELD and MI6. He continues to this day, but on the side of his job as a teacher of Eastern philosophy and religion at NYU as well as the martial arts studio he runs out of his home. Noble pacifist: Shang-chi was raised by one of history's great monsters to be one of history's great monsters, but somewhere along the way his education in Taoism and Ch'an and the genetic code left to him by his banished mother took him in another direction. He abhors violence but if that is the only way to protect those who need it, then by the Tao he will personify ultimate violence for as long as is needed and not a moment more. And then probably try to help whoever he just trashed. Humble student: Shang-chi doesn't believe in knowing. He believes in being in a constant state of beginner's mind, coming at everything as freshly as possible. This is humbling but is also liberating as he is rarely trapped by preconceptions as most people. Present/Selfless/Compassionate: These are all effectively synonyms in terms of the Way. Shang not only believes that there is only now, he lives it. This presence feeds his awareness, but it also means when interacting with people he is truly seeing them, seeing what they need and letting the moment direct him in that regard. Some people find this disconcerting intensity, others are shocked open by it in a good way. It also means that when he doing something he is giving his whole to it. There is no fish or fisherman, there is only fishing. There is no kick and skull, there is simply the act of kicking. This is removing the self from the equation of life, and it is the source of his devastating effects. As far as his compassion goes, the selfless version removes the ego from the equation. It removes what you *think* is needed to help someone and lets you see what is *actually* needed. Shang will help those in need, but often the solution he sees isn't what those in need expect. Family: The place where Shang-chi sticks, aka why he isn't a full Zhenren/Buddha (realized man). Shang's remaining significant point of attachment is his family, his sister and father and even his beloved mother who was forced to leave him. He cannot burn up the karma between them fully and so when they are involved in a situation, he cannot think as clearly, be as present, as he normally might. Simple: Shang is honest, says little but says it deeply, and does not like dishonesty, corruption or abuse. He sticks up for the little guy. He also likes the Stones, pizza, sci-fi and Adidas track pants. Discplined: Shang is also one of the most self-disciplined dudes walking the Earth. When he sees that something needs to be done, he will do it regardless the effort or pain. ELIXIR VITAE: Shang-chi was forced to take some of his father's legendary Elixir Vitae in order to cure a virulent poison. This has reacted with his dna from Fu Manchu and has extended his life. Born in 1952, Shang looks in his early twenties. It is unknown how long this effect will last. HERITAGE: Shang-chi is Fu Manchu's son and this brings a lot of complications. He was supposed to "succeed" Fu, by which Fu meant to possess Shang's body to continue living. But with Fu now dead (mwahahaha), there are those who would blame Shang for the sins of his father, and there are those who look to him as his father's successor. 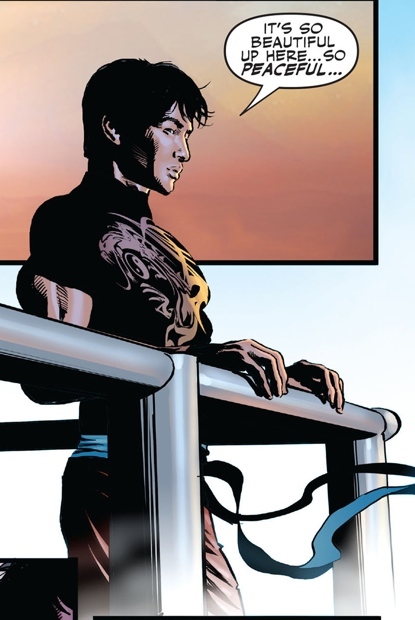 Shang-chi has already taken command of the Si-fan once to minimize their damage. He has connections with them and could do it again. Unless his sister has something to say about it. What this also means is that, despite having given up Fu's known properties and wealth, Shang knows a few emergency stashes that are left. Inlcuding one with a crate full of Elixir Vitae. SPYCRAFT: MI6 and SHIELD are resources that owe Shang-chi big time for his services. He can tap them for info or help but generally doesn't like to because he hates owing such a sordid world favors. UNDERWORLD: Specifically the shady Asian underworlds including the Si-fan, the Hand, and underground streetfighting the world over. Shang-chi is a legend. THE legend. He knows who to squeeze to track down info, or who will give it him like a fanboy. HOME: Shang has a secluded property in Kwang Tung, China, where he goes sometimes for peace and fishing. He has paid for this with his own money earned, as Shang will use nothing of his father's ill-gotten gains. He also has a large warehouse space in New York which he is converting into a loft space. Simple, tasteful, but with space for a studio to train students including local kids. ETERNAL YOUTH: Possibly eternal. It's not known. What is known is that without finding a way to extend loved ones' youth, Shang-chi will have to watch them grow old while he doesn't. Or does so so slowly it barely matters. KARMA: Thanks to the DNA and insane will of his father Fu Manchu and the path through life he has followed, hell follows Shang-chi through many lifetimes. Villains looking to use him or punish him for his treason. The children of those wronged by his father looking for vengeance. Secret society's wanting him to lead their insane enterprises. Mystics and scientists who want Shang's blood and dna to wrest immortality from him. Lovers who die or watch their family member die because of everything listed here already. It never ends. Some dads really are worse than others. FU MANCHU: Fu Manchu is the original megalomaniacal super-science world-conquering super-villain, and some would say still the nastiest. Definitely top three. He sweats evil nightmares. He is in a sick way eternals, sometimes literally, sometimes through his long-term machinations. His plans for Shang have been to use his body as a fresh host. His plans still reach out from beyond his possible grave and probably will for all Shang's life. After all, Fu had the power to scry probabilities of the future. While he goes along living life and being a pretty stellar guy, stuff pops up in Shang's life that is horrible. And often it traces directly back to his dad, which means it will be extra twisted probably involving poison, mind control, genetically altered men and monsters and hybrids of the two and lasers that may or may not blow up the moon. SISTER: Fah lo suee is not twisted like their father, but she is every bit as determined and driven as her brother. Perhaps more so, as he follows the universe instead of trying to impose his will on it. Though she hated Fu, she has complicated feelings about her brother killing the old man (even though he really wasn't responsible... he was kind of just there). She also wants uncontested command of the Si-Fan and doesn't appreciate Shang as a contender (again, even though he wants no part of the criminal organization). She has tried to kill him with her significant crime lord resources and she has struck through his friends and loved ones. She is also as long-lived as he and dangerous one on one. SECRET SERVICES: MI6 just will not take no for an answer and frequently show up to force Shang into helping them. He can't be forced, but he will still allow himself to fall for old loyalties to friends (though he barely recognizes these people as friends these days, most of those who were are dead dead or near death). Similar with SHIELD. He has to have his conscience played upon by framing the mission as one that will save lives, literally and metaphorically. Or prey on his guilt by linking it to his family. Even then he knows he's being played, but he will dip his lethal toes back into the filthy world he hates so much. And invariably pay for it. Selfless. using bare hands or melee weapons). - Attack roll for punches, kicks, elbows, etc: Fantastic (60). - Damage for punches, kicks, elbows, etc: Remarkable (30). the Blunt or Edged attack column. with higher Endurance than his Strength. - Shang-Chi suffers -1CS damage from any hit in melee combat. - Initiative bonus when punching, kicking, etc: +1 to roll. - Initiative bonus when grappling: +2 to roll. declared before declaring his own actions for that round. - Shang doesn't require rest to heal. extra attack against that target. and other defenses when checking for a STUN or SLAM result.